While attending the premiere of 'Bunny and the Bull' Noel Fielding and Julian Barratt confirmed that they are working on a Mighty Boosh film. "We're writing a film at the moment and an album, so hopefully next year. Both of those things." However Noel refused to give anything else away about the project. "I've got to stop doing that,I've been stung too many times." Julian Barratt offered a little more detail about what to expect. "We've been very inspired by this [their mate & Boosh TV director Paul King's film Bunny and the Bull] because we've been doing the show and touring a lot and we've finally got round to writing." "We try and do, on TV, quite magical epic journeys and we thought if you're doing a film we should really do it in one room, basically just kind of a sitcom for 90 minutes. "So we might do that. We might do exactly what we didn't do on TV." 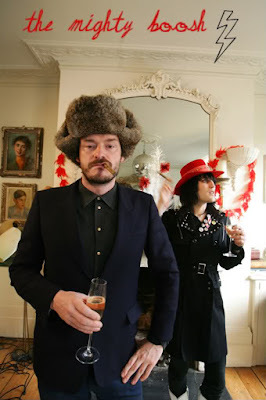 On recent rumours the Boosh were set to split, Barratt added: "We're still together! It's like we're twins, we're kind of symbiotically linked... if he drinks I get drunk. Like E.T. and Elliott." 13/11/09 Updated: Noel Fielding has pulled the plug on his 2010 solo stand-up tour. He had planned 17 dates in February and March but cancelled them all, saying he wants to concentrate on writing 'The Mighty Boosh' film with co-star Julian Barratt as well as a music album. Fielding’s publicist later confirmed the tour was being axed because of the film, but said it would be rescheduled for a later date. Barrat also commented recently regarding the film's script progress at a Boosh live DVD launch "We're writing it now. Putting things on paper, doing drawings, touching each other."